December 13 - Saint Lucy of Syracuse, Virgin and Martyr – Memorial - My Catholic Life! THE mother of St. Lucy suffered four years from an issue of blood, and the help of man failed. St. Lucy reminded her mother that a woman in the Gospel had been healed of the same disorder. “St. Agatha” she said, “stands ever in the sight of Him for Whom she died. Only touch her sepulchre with faith, and you will be healed.” They spent the night praying by the tomb, till, overcome by weariness, both fell asleep. 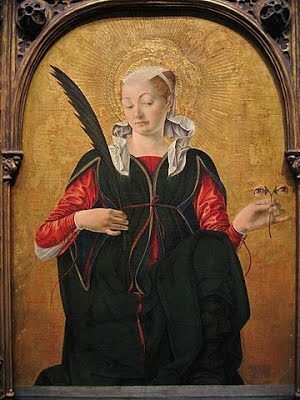 St. Agatha appeared in vision to St. Lucy, and calling her sister, foretold her mother’s recovery and her own martyrdom. That instant the cure was affected; and in her gratitude the mother allowed her daughter to distribute her wealth among the poor, and consecrate her virginity to Christ. A young man to whom she had been promised in marriage accused her as a Christian to the heathen; but Our Lord, by a special miracle, saved from outrage this virgin whom He had chosen for His own. The fire kindled around her did her no hurt. Then the sword was plunged into her heart, and the promise made at the tomb of St. Agatha was fulfilled. Reflection.— The Saints had to bear sufferings and temptations greater far than yours. How did they overcome them? By the love of Christ. Nourish this pure love by meditating on the mysteries of Christ’s life; and, above all, by devotion to the Holy Eucharist, which is the antidote against sin and the pledge of eternal life.